ST. GEORGE — With snow blankets at higher evaluations, wild animals are on the move. Most of them cross the roads during their seasonal migrations as they search for food, water and cover. Wild animals often move under the cover of darkness, with peak times during the low light of dawn and dusk. Unfortunately for them, and the unwary motorist, these peak times often coincide with rush hour. Deer migration corridors are the areas of highest risk and are often clearly marked with signs. Research from Utah State University confirmed that if motorists drove the speed limit in the areas of highest risk, they could reduce their chances of having a deer-vehicle collision by over 200 percent. While wildlife crossings can’t be anticipated, learning about wildlife behavior and driving more defensively can help prevent accidents. Be especially alert at dawn and dusk. Motorcyclists should be extra cautious during these times. Heed the wildlife crossing signs by slowing down. These signs are placed in the areas known to have the highest number of wildlife-vehicle collisions. Be especially alert on roadways near wooded, agricultural and wetland areas and by lakes and streams. Scan both sides of the road. Ask your passengers to also help you look for wildlife. When able, use high beam headlights to illuminate the road. Do not drive distracted. Put away food, phones and any other distractions. Look for the shine of an animal’s eyes, which can be seen from a distance. Slow down if you have spotted an animal near the road. Animals often travel in groups, and there may be more following behind the first one, so keep watching. In addition, an animal that has crossed the road may try to cross again. Do not throw food scraps or trash out of your vehicle. These can attract animals to the roadways. If you see an animal on the road, do not swerve. Stay in your lane and slow down. If several animals are standing in the road, do not try to drive through them or get out of the vehicle to chase them. Honk your horn and flash your lights to encourage them to move on. 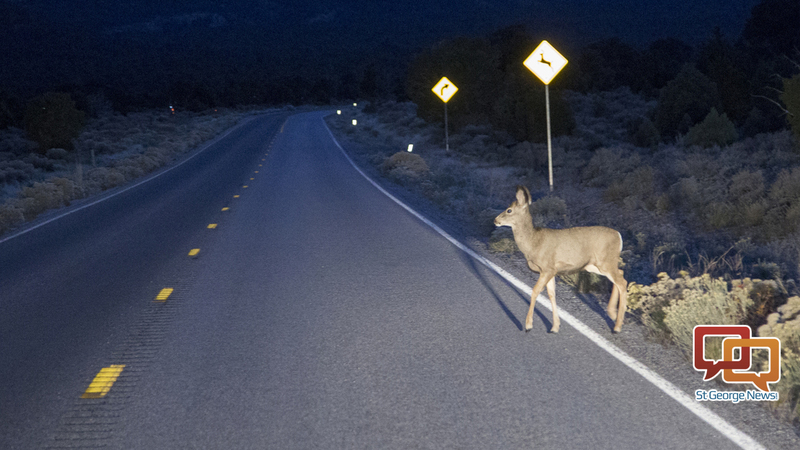 If you have a vehicle-wildlife collision, pull off the road and turn on your hazard lights. Do not try to approach an injured animal. Call 911 or contact your local police department. If the animal is injured and you are still able to locate it, the police department or sheriff’s office can contact a conservation officer to assess the animal’s condition. Most importantly – drive the speed limit and buckle up. Written by TERRY MESSMER, Utah State University Extension wildlife specialist. This can’t be stressed enough. Even if you hit the animal, that is a “softer” collision than swerving to miss the animal, and rolling your vehicle. This is seen all the time. This is a trained reflex to not hit an animal. Last week, when a squirrel ran in front of my car- I swerved. I was like what the heck, why didn’t I hit him? I barely missed the ditch to my right. It could have been bad. I stress to everyone to hit the animal- do not swerve. Train yourself. Train yourself now! It will save your life.